Among sectors that have suffered quite substantially during the imposed war in Syria are healthcare and medical services. Fingerprints of U.S. imperialism can be found all over the manufactured insurrection there. A sectarian uprising was fomented to serve the ultimate goal of destabilization and eventual “regime change.” Prior to the internationally imposed war that has cost over one half-million civilian lives, and resulted in millions of refugees, the Syrian Arab Republic had made substantial improvements in these sectors. Healthcare in Syria is relatively decentralized and offers services to both rural and urban areas. Since the war began it is difficult to fathom on-the-ground conditions and consequences in Syria that have resulted from seven years of conflict. Although we might be privy to the images of the suffering, death, and destruction that has taken place, the daily struggles Syrians have endured exceed our comprehension. One of the main reasons for this disconnect is that selective information is being transmitted on our airwaves. Western media has been discriminatory and biased, choosing which aspects of the war to highlight and which to withhold. A filtering process serving carefully planned regime change and war propagation agendas. Nonetheless, progress to rebuild and improve medical and health conditions are proving fruitful and are helping to counter efforts made by nations with vested interests in seeing the cradle of civilization destroyed and reduced to rubble. In an interview granted SANA Health Minister Nizar Yazigi said the Ministry’s hospitals and centers provided around 40 million health services at a cost of over SYP 81 billion in 2017, showing the exceptional efforts of workers in the health sector despite circumstances of the war. He said that in 2017 42 damaged health centers have been repaired (6 in eastern neighborhoods of Aleppo city), asserting that the Ministry will continue repairing damaged centers in areas secured. He added that 5 new health centers have been opened in Aleppo, Tartous, Homs, and Damascus Countryside and 26 new ambulances and 6 mobile clinics were put into service during last year. Yazigi pointed out that terrorist attacks left many people with injuries and disabilities, prompting the Ministry to expand the work of its prosthetics unit. While that unit provides around 35 prosthetics to patients each month, investigations teams have been working hard across all provinces to monitor for possible epidemics and prevent the spread of contagious diseases still within normal limits in Syria. Regarding pharmaceuticals, the Minister stated locally-produced medicine covers around 90% of the local population’s needs despite difficulties encountered, and efforts are ongoing to work with friendly countries and international organizations to access types of medicine not produced in Syria, such as vaccines and medicine for hereditary, immune, epidemic, and terminal diseases, and build production lines for these types of medicine. He said there are currently 1,195 health centers providing medical services to citizens, with special emphasis on 7 vaccination campaigns; 5 to provide polio vaccines (2 of those in northern provinces) and 2 for measles vaccination campaigns across the country. Regarding future plans, Yazigi said the Ministry will soon launch both a services center to simplify and facilitate paperwork and a project for establishing a database of medical human resources and equipment. 17,000 adults and up to 500 children received diabetic treatment in Damascus alone, according to Walid Makhlouf, Head of Specialized Medical Centers. Additionally, in order to help educate patients about their condition, diabetes awareness sessions are held regularly which, according to him, provide beneficial psychological support as well. According to SANA, the health sector in Syria has achieved a new stage of recovery in 2017, particularly in Deir Ezzor and Aleppo, through continuing rehabilitation of health centers and hospitals affected by terrorism. New sections were opened at standing health establishments provided with medicines and medical equipment to meet the increasing demand for therapeutic and medical services. The Health Ministry announced again this year that it managed to prevent outbreak of any epidemic despite the circumstances of terrorist war waged against the country. It asserted that registered infections with communicable diseases were within normal rate due to efforts exerted following up and immediately intervening in health situations while paying attention to periodical vaccination programs and campaigns. Most medicine factories damaged by terrorism returned partially or fully to work as new factories were licensed and opened in Tartous, the industrial city of Adra, and other areas. Regarding medicines not produced locally, the Ministry continued coordination with friendly countries to procure them and operate new local production lines for medicines addressing chronic diseases. In 2017 Syria participated in several international specialized conferences; at local levels, about 60 conferences, workshops, and symposiums were held. Wars reveal and exacerbate socioeconomic issues which typically lag long after bombing campaigns have ended. 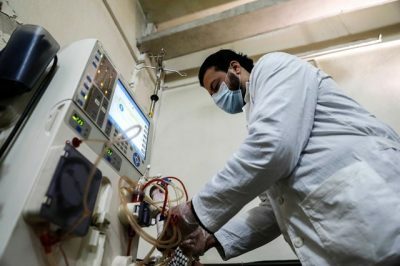 Despite relapses caused by this imposed conflict, which has visited a particular sort of “brutality” upon Syrians already battling a metabolic enemy they’ve no choice about, we are seeing substantial efforts made by the Syrian Health Ministry and the government to repair and progressively recover quality of health and living conditions for civilians.